Nowruz marks the start of the new year and has been celebrated for 3,000 years, observed by adherents of both main branches of Islam, Sunnis and Shias. 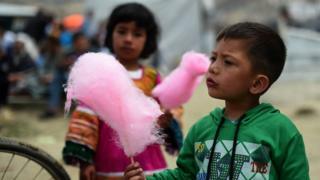 But in Afghanistan a campaign by conservative clerics to discourage the festivities has led to confusion and uncertainty among a new generation, the BBC's Auliya Atrafi reports. This year people across Afghanistan, Iran, Central Asia and parts of the Middle East will begin celebrating the ancient spring festival of Nowruz on 21 March. When I grew up in Nad Ali district in Afghanistan's Helmand Province, Nowruz was a light-hearted and much anticipated event. Our town of Cha Anjir was isolated but still the spirit of Nowruz reached us. I remember running around with other children, uprooting green shoots of wheat and hanging them upside down from our front doors in the hope of a prosperous year ahead. In Lashkar Gah, the provincial capital, they had large family gatherings on the banks of the Helmand river or in the forest, enjoying the "seven-fruits" dish, a traditional mix of the fertile region's dried fruits and nuts served in syrup. And if you went up to Gereshk, you could experience what was a mainly female event. With its mixed population of Shia and various Pashtun tribes, Gereshk had a quirky culture all of its own. On the day of the spring festival, women would visit a series of Shia and Sunni shrines, some of which had playgrounds for the children right next door. At the shrine of Sayed Tajdar, women would unveil once they entered the big garden and celebrate amongst themselves. But the festivities were not limited to my home region, Nowruz was a countrywide celebration. On the plateau of Bakwa in Farah province to the west, women from over 300 villages would gather on the green plains, while in the distance, spectators sat on their camels and watched men wrestling. In another part of the country, in Zurmat district of Paktia province, a band of Taliban musicians would be playing their "Sauspan" music. It almost seemed to be a time of harmony between the Islamic faith and ancient traditions in Afghanistan. If we travelled north-east to Ghazni province, Nowruz would take on a more mythical character. Farmers here would bring out their bulls and plough the fields in a ceremony called "cattle-cooling". It was a tradition designed to bring the cattle out of their gloomy winter imprisonment. But it was also a glimpse back to the time of the ancient and legendary King Yama, credited with an agricultural revolution bringing a more settled and sedentary lifestyle. After the bulls ploughed the soil, young men would engage in jumping competitions on the soft ground. But the ancient spring festival is now under a shadow of fear and doubt that could undermine its very existence. In Farah province, the main site of the festivities - Kafir Qala - recently saw the killing of three youths out picnicking, supposedly by the Taliban. The insurgents have issued threats against Nowruz events and locals say they may not dare to participate this year. In Lashkar Gah, people are worried by rumours of female suicide bombers smuggling themselves into the women-only park. But perhaps a far greater threat to the festival is what appears to be an outright campaign by some imams in local mosques, preaching that everything predating the arrival of Islam is invalid and that Muslims only have two happy events in the year - the two Eids. Such an ideology is targeting not only the mainly uneducated Afghan countryside, but the educated youth of the cities too. And it has caused confusion and uncertainty among young people who are left wondering whether or not to celebrate this ancient festival of their land and their forefathers. I decided to to a little research, starting at home to see whether a new generation now views Nowruz as something sinful. My 16-year-old son was unsure. "If the imam says it's forbidden, then we shouldn't celebrate it really," he said. My 18-year-old nephew was a little more pragmatic: "If we look at the scripture, it is un-Islamic, but then it's everyone's own choice," he suggested. Many believe that this puritanical thinking is the product of the Salafi school of thought, spreading throughout the world with the help of imams, social media and backed by Saudi oil money. So whether a young man lives in Herat, London or Helmand, an internet search will produce the same conservative anti-Nowruz messages. It's fascinating to witness this clash between the deep-rooted Nowruz tradition and the vigorous global campaign of the Salafists. But looking at the history of the traditional marriage between Afghan culture and Islamic faith, I would bet that Nowruz will survive the challenge. My faith lies with the observation of my 13-year-old cousin Ahmad Shah who told me: "When the imam preaches against Nowruz, everyone nods, but as soon as Nowruz arrives, the streets empty and the mountains behind our home fill up with picnicking families." So it's likely that the picnics and family gathering will continue; the newly engaged will send each other gifts of clothes, and the bride-to-be will get a surprise in the form of an early morning breakfast in a women-only hamam sauna arranged by her girlfriends.